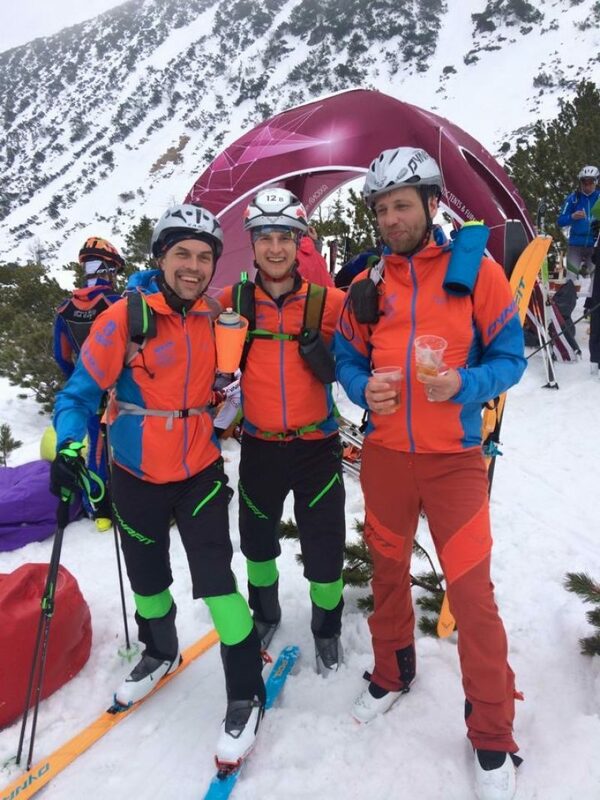 Ski Mountaineering is definitely one of the toughest mountain disciplines out there, whether you do it for fun or race for competition. It combines fast ascents, with even faster descents, mixed in with some technical mountaineering skills, generally on skis (ultra lightweight ones at that) or with crampons on your ski boots. 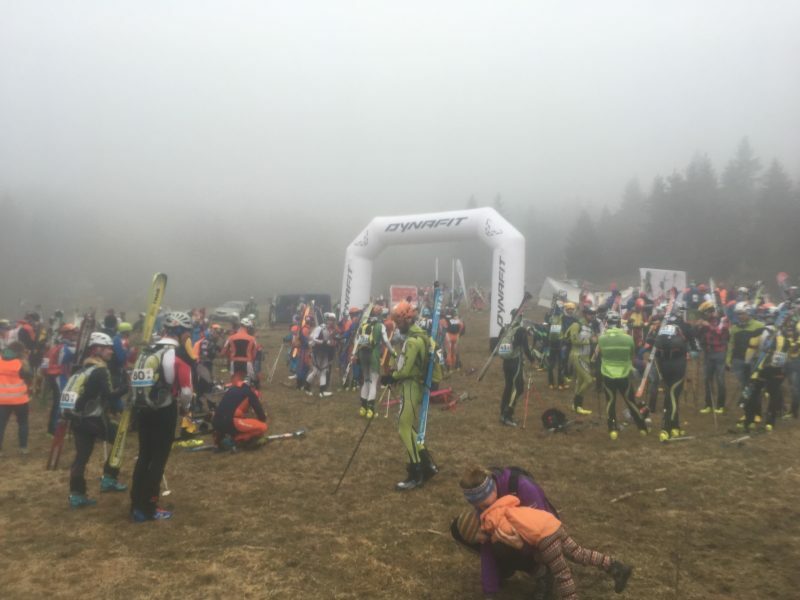 I thought I might be able to gain a little experience of the race scene from doing the Scottish Skimo series over the preceding winter season.. but to my disappointment, along with every other person wanting to do this series, the UK gave us zero conditions for the date of the Scottish Skimo series for 2016/17. I took a look at the website. It said 20km per day with 2200m of ascent. It scared me a little if I'm truly honest, but I reasoned I could run double that per day, so what was the issue. I've been lucky in life, I've been on skis since I was 4. I'm very lucky now, I live underneath Helvellyn and Catstye Cam, basically I'm on the east side of the Helvellyn Massif up at the head of the Glenridding Valley. 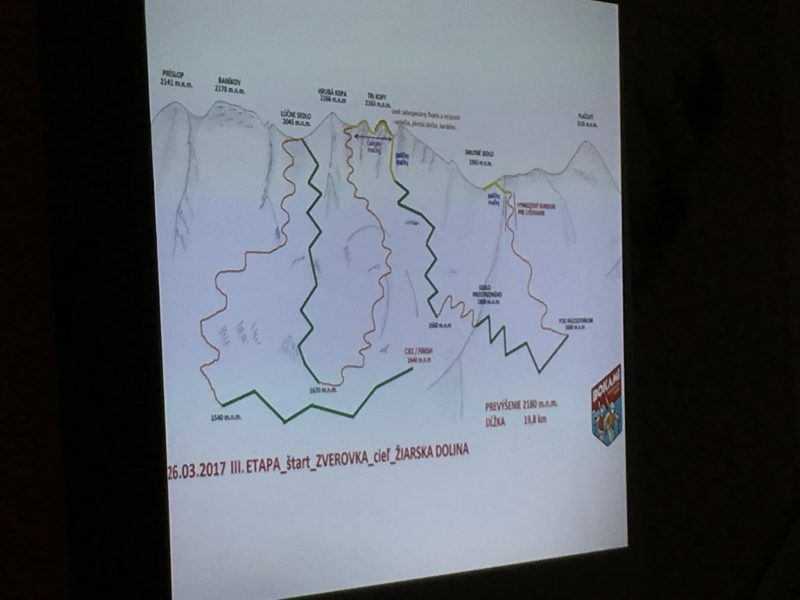 The Bokami Západných Tatier is know as the pinnacle and toughest skimo race in the Slovakian skimo race series and finishes the season. Its designed to be tough, fast, furious and very technical. When we entered we were a little wet behind the ears about the whole thing. On top of this the UK winter for 2016/17 has been the worst since 1991 (quoted by a ski patrol in Cairngorm on a training ski) and therefore we've had very little time to practice in skis for this season. 6 days in total on skis prior to the event and only 2 of these on my new Dynafit ultralight race skis. Most of the other racers will have been on skis for most of the season and racing on them as well. 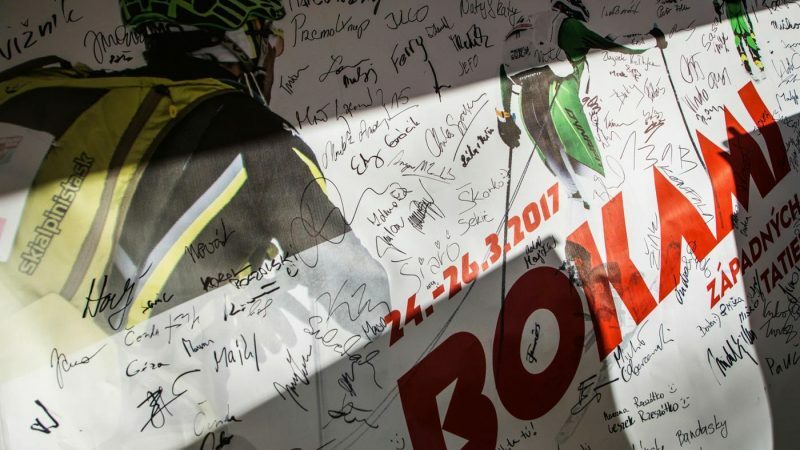 Race day was almost upon us and we flew with a mountain of kit to Krakow in Poland and took a hire car to drive the 3 hours to the start. I have to say I don't think I have felt this sick, pre-race, since I first entered my first fell race or mountain marathon. We arrived feeling stressed but ok and entered the registration. Everyone looked experienced.... (how else could they look, its all perception and we might well have looked experienced as well, but I certainly didn't feel it!!). We are/were the first Brits to enter and take this beast on, possibly we were a little bit of an enigma. Registration ticked, we bought tee-shirts, hats etc and settled in for the evening in our 'utilitarian' feeling rooms, you could feel the 'post communism' vibe, even though it is many years since the regime left Slovakia. We met with some of Gus business friends and had a nice evening, trying not to panic. 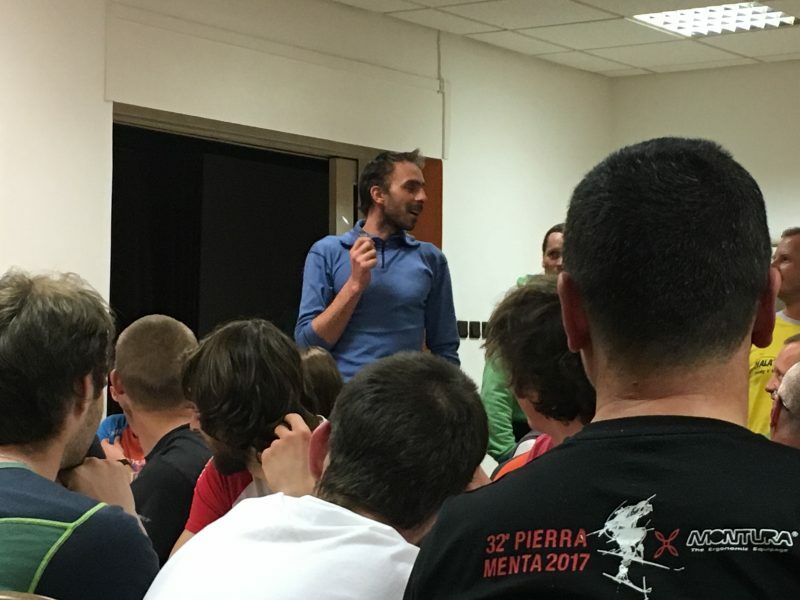 After listening to the pre-race briefing, it was time to pack bags for day 1 of the race, no crampons, axes or technical kit needed, so an easy day, bar the speed we would need to travel. One thing we discovered was that the rules had changed. No longer did we have around 5 to 6 hours to complete each day, now we had to finish and make it through each CP within 70% of the leaders time... the leaders would finish Day 1 in around 2 hours, so this gave us roughly 3.45 hours to complete Day 1... gulp... this was a big step up and when I discovered we were racing some of the worlds best skimo racers (Emanuel Pascal - 20km Skyrunning Champion) then I was slightly freaked.... still, we were here and what else could we do? Sleep came easily, that was a bonus. Day 1 is crazy. 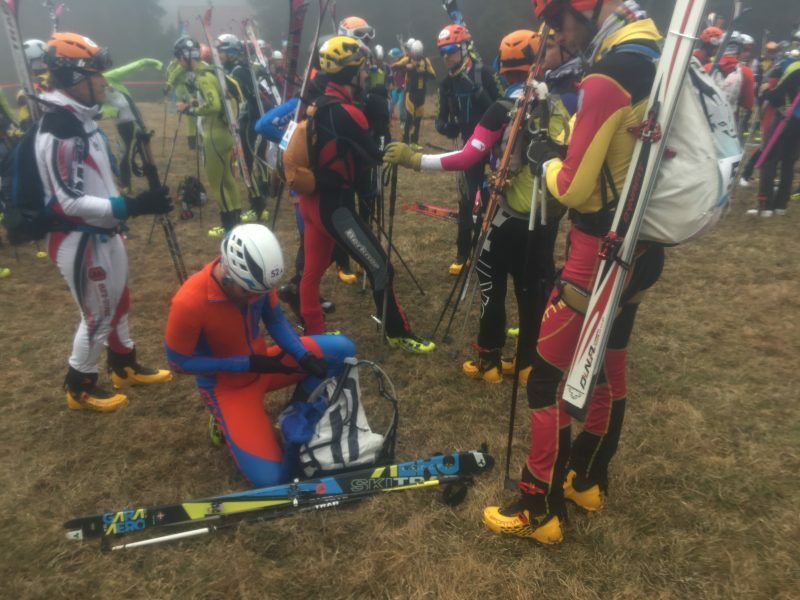 We start in fields without snow, everyone has skis stropped to their race packs and as we ready to set off I'm bricking it about running uphill with ski boots on!! The race starts, we're underway and the best thing is we aren't last. We run for a short period and then we walk... I nordic walk to keep my momentum up and run occasionally to overtake the odd person here and there, Gus breathes heavily that he can't move faster, but that ok, as I'm running on adrenaline and this is false energy. We get the snow and transition quickly, we're now moving on skis and its feeling good. The ascent continues and I feel better, the skiing is good, traversing a mountainside is ok, slightly technical but ok. We hit a col in a ridge and its transition time to ski downhill for the first time. We set off and the angle is steep, black run or more and there are small trees everywhere to avoid. The snow is spring corn/slush, its heavy and we're moving fast. Gus falls, but he's up and ok, turning is tough, but we're all good and hitting the next transition to start climbing again. Again I feel good and push on, Gus has problems with traction and his skins, we lose some time, but its ok, we're not last! We hit the next col and transition again for a great descent, transition again and we're on the final ascent according to the marshals. 300m height gain and we're on the final descent into the ski resort finish, bells are ringing on the col, people are cheering and we drop into what looks like a vertical cornice, that is actually a nice black/red run. Amazing skiing through rolling terrain brings us to the finish and we're ecstatic that we finish day 1 still in the race! Day 1 in the camp is good, the hotel is again 'utilitarian' but its comfortable and fine. We get changed after having a hot shower, life is good and we have a 2 course meal to eat. This is amazing. 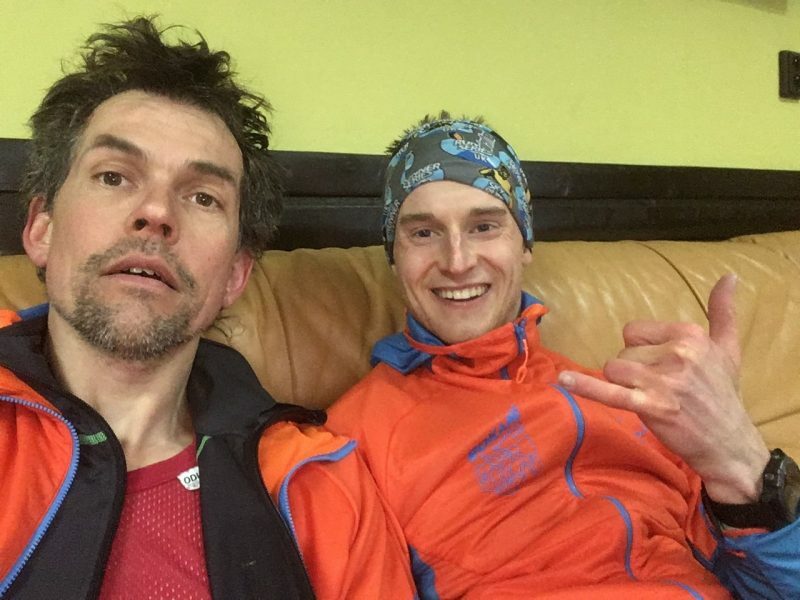 We spend time chatting with the others racers who speak english and are al connected with Dynafit in someway and then we have a short lie-down to rest. Back to the restaurant, and its a 2 course dinner, similar to lunch. I'm in the bar, thing about buying a beer, its only 1€ per pint for perfect Slovak beer and this guy looks at me and say's "No f**king Ambleside Shandy for you mate!"...... what? I ask, where did you learn your english, assuming he knows the Lakes obviously, and he retorts, "Kindergarten" to which I laugh and ask him where he really learnt it. It turns out his name is Igorivich and lived up Langdale for a while, whilst working on the footpaths and in the Stickle Barn, turns out he knows friends of mine from the valley and my climbing partner Honza... well what a small world. He buys me a Bronavichska (spelling most likely wrong) which is the local Slovakian Gin, we toast and I buy a beer. Bed calls and Gus and I prepare for Day 2 after the race briefing. They are fully imposing the 70% cut off's for day 2, we will need crampons and things are getting technical and more real. Sleep is good, but I'm whacked on Codeine 30mg x 2 tablets to keep an shoulder injury from stopping me sleep, most likely I shouldn't be racing... but... I snore... I can't lie on my side and I think Gus doesn't sleep so well. Day 2 breakfast is great again and we walk the 2 km back to the start at the ski resort. I feel good. We're both nervous, but all is good, the sun is shining, life can't get better. People are warming up, skins on, skis on and basic skinning up and skiing back down to warm the legs, into the starting pen now, 'peeps' checked and on, the horn sounds and we're off, running on skis up hill as we pass the camera... f**k... I'm struggling to breathe, today isn't as easy for me right now. We find our place near the rear of the pack and settle in. Gus is stronger today. My skins slip here and there, I fall on one of the zig zags and I'm finding it tough. 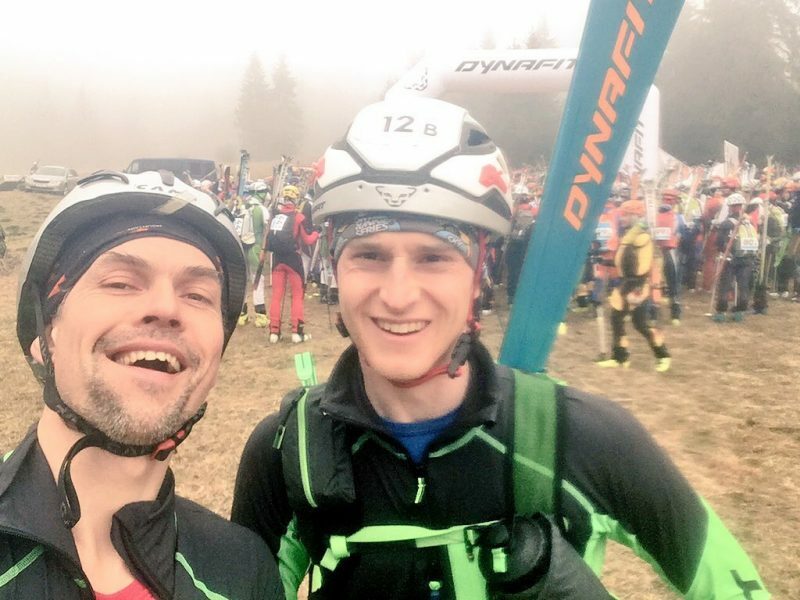 Igor powers past (we were ahead of him on day 1), but this is ok, he is Mountain Rescue for this area, he should be fit. We summit the first ascent, not last!! We transition and we're running a rocky ridge in ski boots holding our skis in our hands. 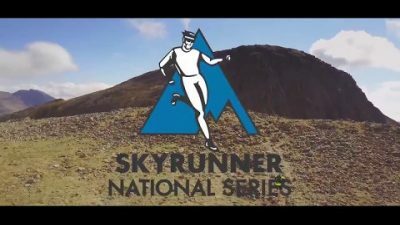 Its fell/skyrunning in ski boots and I love this. Gus is now behind, but we are together again on the next ascent and we push, make the next transition. Gus is slick, I faff, we drop in, sh*t is steep, but all is good and we are skiing past other racers to the next transition and ascent. The next ascent is steep and icy, my skins keep slipping and there are some folk taking photo's and supporting on one of the corners we make a steep turn on skis, these are scissors movements and not a place to slip, which I do (I haven't been able to eat or drink, solid food is not good and my bottle is hard to access with poles in my hands, I'm sugar crashing hard but can't do anything about it). My slip turns into a fall and I start slipping headfirst downhill, the gradient is over 30 degrees, so steep. Gus grabs my ski as I'm trying to re-right myself and I brick it as I can't get my skis underneath me... this gives me a shot of adrenaline that I didn't need and my legs turn to jelly..... but I'm ok and I'm up now and we're moving uphill and my head is spinning. Next transition is crampons and we're ascending a grade 1 snow slope to the next transition. We use ski poles like axes and my head spins wildly from lack of sugar and I feel like I will fall off at any point, but I keep pushing best I can with the weak legs I feel. Gus is moving well. Some how I get some much needed Pura Perform Charger 90 electrolyte in without dropping my poles, falling off or dropping my bottle and it helps me to keep moving and not pass out, which is how I feel right now. Transition leads to a great ski down the other side and the next transition is gained in minutes and its skis back on and try to eat, but I'm too far gone, I can't chew, I don't want to eat, so I have my only gel (its gels 100% for the next year), which gives me the energy to get up the next hill. Gus is strong today and is moving well, we should have brought a tow rope! We will for next year. We make the next summit and the drop in is technical, like skiing off the Helvellyn Headwall almost, some of the route takes us over avalanche debris and this is hard to ski on this skinny skimo race skis, but I ski is well, I'm really please with my performance. Descents for me are easy today, its the ascents I'm suffering with. We're gutted, but then I remember we have never done this before and we're here to learn, this is what my Bowen Therapist, Alan Brindley, who used to be a running coach, ski instructor, great runner and alpine climber had told me I ought to approach it like, he said go and learn this year and go back to race the following year. He was right. We ski the final descent, the pressure is off, but we're still gutted. Hey ho... next year is already in my mind. It turns out everyone else knows the cut off times as they go through each CP, apart from us, we're British and we can't understand Slovakian, so we don't get this info... it feels harsh, as the time we were timed out by was 60 seconds... but this is the race rules, so I abide by it without a quarrel. We plan to do Day 3, but after waking and setting off, we realise we've lost the race psyche. We ski back to the Day 1 start via some of the race route and have a cracking day out, its been an amazing experience and I've met some really cool people, understood the race and had a brilliant time in the mountains with my good friend Gus McKendrick. We'll be back for 2018 for sure, now my mind is thinking about how to train so we don't get timed out for next year, about how we can become competitive. I'm hooked, this is the best race I've ever entered and now I'm addicted. 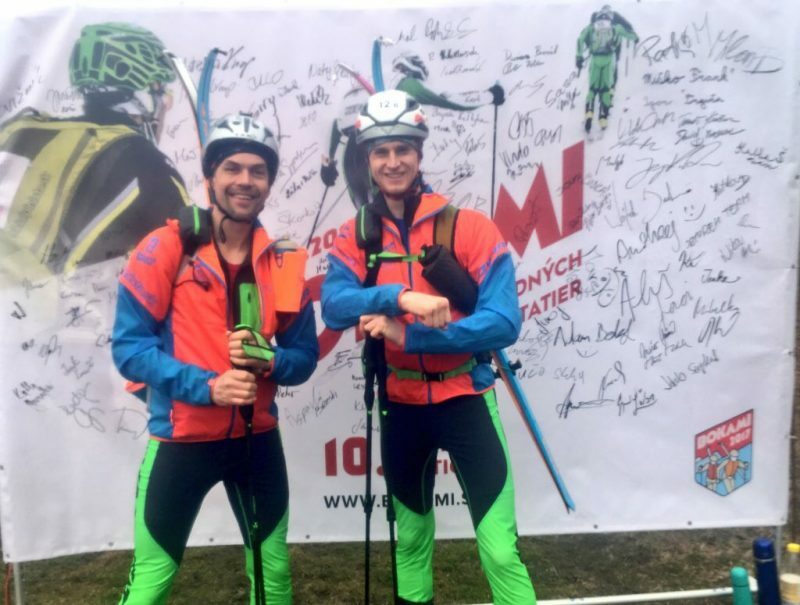 Skimo racing it what I've been looking for..... but how to bring it to the Lakes?? ?